An individual's sum total of life experiences, including traumatic events, saturates every part of his or her physical body. A person is much more than the thin, shifting attention or consciousness. It is crucial for clinicians and therapists to realize these depths when helping patients to heal from and move past traumatic events. Methodologies that deal with traumatic experiences at the juncture of body-mind are highly effective. A somatic approach is needed since factors affecting the body keep the trauma in place. Focusing reaches into the body - the body we can sense from the inside. When we are Focusing, we enter into the body more and more deeply, finding intricate patterns of personal experience. For this reason, Focusing is widely used by experts on the healing of trauma and PTSD (post-traumatic stress disorder). Focusing allows an individual suffering from trauma to be in contact with their bodily felt sense of a traumatic experience as a safe observer, and always at their own pace. The felt shift that occurs during Focusing allows the individual to change the way that the traumatic experience is lived inside the body. Focusing allows the individual to move forward, and to heal from a position of authentic power. As well as being an effective treatment for trauma on its own account, Focusing can also be easily combined with a variety of other helpful methods: for instance, Focusing works well in combination with EMDR, a leading method for treating trauma. As an innovator in contemporary focusing practice Jan Winhall’s latest work Understanding and Treating Addiction with the Felt Sense Experience Model has been included as a chapter in the book Emerging Practice in Focusing-Oriented Psychotherapies: Innovative Theory and Application. Resulting from her longtime practice as a psychotherapist, Jan Winhall’s model has created a way to work with the complexity of behavioral addictions using a focusing approach. The model is useful for understanding how emotional arousal is connected to addiction and wellness. The model is broadly applicable beyond addiction and may be used in teaching focusing and the process of therapy from initial assessment to the longer path to healing. Winhall’s integration of theory into a working model is grounded in Focusing-Oriented Therapy. It includes perspectives from attachment theory, trauma theory, ego state theory, Carnes addiction theory, interpersonal neurobiology, and the neurobiology of addiction. Winhall’s model sees addiction as an attachment disorder; when insecure or avoidant attachments are formed through early experiences the client has often learned to self-regulate and soothe through external means such as addictive behaviours. Examining addiction through the lens of trauma theory the addict moves between states of hypo and hyper arousal, dissociated from the memory of painful experiences. Over time the addict learns to regulate uncomfortable arousal states by self-medicating. Winhall’s model graphically represents the felt sense experience using the two axes of attachment and arousal spectrum. Four self-states are created by the division of the axes which may also be seen as the four aspects of experiencing: thoughts, feelings, physical sensations, and memories. Winhall sees much of the work of therapy as capacity building accomplished through the identification and tracking of ego states; through these states we create internalized representations of aspects of our life and self. The therapist acts to embody and model a grounded place that allows development of a secure attachment and the ability to recognize and shift arousal states without self-medication. In the beginning stages of therapy building a grounded place as a felt sense experience and an ego state helps the client learn an embodied way to access a state of self-regulation. This process also aids in developing an awareness of triggers that have lead the client to addictive behaviours, and also those behaviours that aid in the maintenance of sobriety and health. In the middle stages of therapy a client’s personal narrative is developed while expanding the grounded place and the range of feelings a client can tolerate. In the consolidation period of therapy the client learns to integrate all aspects of their experience while self-regulating their arousal state. Jan Winhall’s model is a departure from cognitive behavioural approaches to addiction. Her model has incorporated emerging research in neurobiology with a focusing based approach. This work starts from implicit body wisdom and moves to create the relational climate needed to repair trauma and insecure attachment underlying addictive behaviours and emotional dysregulation. Winhall, J. (2014). 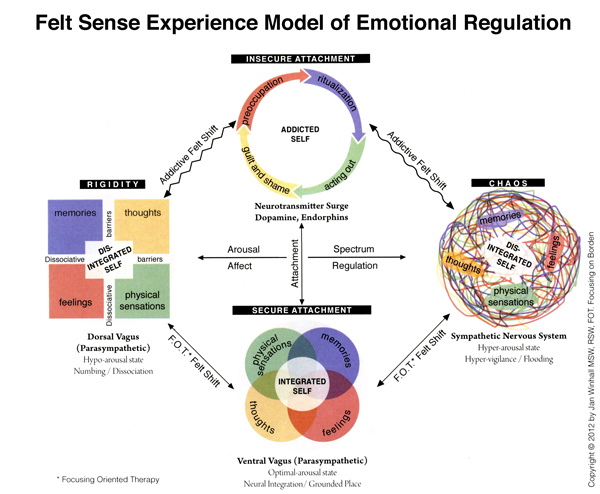 Understanding and treating addiction with the felt sense experience model. In G. Madison (Ed.). Emerging practices in focusing-oriented psychotherapy: Innovative theory and application (pp. 178-193). London, England: Jessica Kingsley Publishers. "It is (Focusing) particularly effective in the treatment and healing of post traumatic stress caused by accident,sexual, physical or emotional abuse, or neglect. because it is such a safe and gentle technique, clients are able to move through the healing process with "curiosity" and with respect and compassion for the self. Focusing has been especially well received in aboriginal communities because of its humanistic, client centred approach to healing which reflects the core values of respect and non-interference." "Excellent Listening is one of the greatest gifts [we] can give to anyone, and it is healing, just being a human listening to another human... Most trauma victims naturally start telling their stories. Excellent listening is a way we can let inner healing process start to heal them. We practice just listening with no suggestions, no fixing, no judging. The quality of our listening is like holding the story-teller in kind, calm caring, in which they can begin to find their own calmness." "Focusing-oriented psychotherapy allows clients total control of the pace and the direction of their healing journey. It is particularly effective in the treatment and healing of Post Traumatic Stress caused by accident, sexual, physical or emotional abuse, or neglect. Because it is such a safe and gentle technique, clients are able to to move through the healing process with "curiosity" and with respect and compassion for the Self. Focusing has been especially well received in Aboriginal communities because of its humanistic, client centred approach to healing which reflects the core values of respect and non interference. "Focusing and all aspects of Focusing are most useful in the treatment of Post Trauma. Clients can learn to observe, with distance, the tragedies of their lives. To be able to observe a flashback or memory while you are in a flashback or memory is a very powerful experience ... the therapist and the client can enter a terrible past scene, freeze frame it and contain what needs to be contained in order for the client to be safe. Then the client can attend to his or herself and do what he/she needs to do and were unable to do at the time of the trauma. One is able to regain personal power, identity, and dignity." "Focusing is at the heart of our Relating Without Violence (RWV) therapy groups conducted at the Ontario Correctional Institute for the past 12 years. The groups are for domestically violent male incarcerates, the great majority of whom meet formal criteria for PTSD. During the Emotional Change module of RWV, experiential Focusing enables the participants to process their own hitherto unexamined physical or emotional abuse. Focusing is also applied in enabling relationship change ¾ from abusive to constructive conflict interactions. During the Relationship Change module we blend Hendrix's Dialogue with Focusing, to develop desired conflict resolution processes. The blend enables the men to access what underlies their surface conflicts. These men who had known only abusive or avoidant processes in dealing with conflict now process a relationship conflict in a constructive way perhaps for the first time in their lives. Focusing is also woven into a powerful procedure toward enabling the men to develop empathy with their victims. Our research shows that the men make great progress. With the use of Focusing guided emotional processing, RWV participants' became substantially less angry and power assertive than a comparable abusive group in the institution who did not receive RWV. The men also come out of RWV psychologically safer and less defensive than comparable controls -- less easily offended, less suspicious that people mean them harm or are against them, less wary, guarded, touchy, denying, self-justifying, more open to "criticism", more open to information from others. We concluded that the men's defensiveness and readiness to attack was lowered by alleviating the fear of re-experiencing the pain and shame which had been felt during childhood trauma. Their Focusing guided emotional processing has been central to enabling the men to deal with primary emotions, so they no longer have to ward off anticipated emotional threats or mask shame by expressing rage." "I follow a gentle process, beginning with a safe relationship. Focusing is of enormous help here, keeping the attention out of the center of the body, more on becoming aware of the extremities, getting easy with the process of dropping the attention out of the head. The therapist models a non-judgmental, non-demanding, positive relationship through the listening process, reflecting, acquainting the client with the ever-present critic and the possibility of becoming conscious of that inner critical voice, its reflections of the client's early experiences of socialization. "This stage is really what I think of as peripheral Focusing, encouraging the client to discover that though deep in his body are experiences he fears being overwhelmed by, there are many ways he can experience his body and his inner critic, getting friendly with them, experiencing their quirks and whims. "You will know when this stage has done its work when the client begins to venture inward. Initially, I do not encourage this movement, instead using Focusing to identify the inner landscape from a great distance, encouraging the client to practice varying that inner distance from "too far away to see anything" down to "too close for comfort." I like to stay in this zoom-zone for as long as the client is willing, using this technique while Focusing to explore early memories, felt relationships with significant others, irritations, amusements, the beginning of tears, just exercising the muscles of the inner world, recognizing the complexity of the self, the many layered nature of inner experience, the ability of the "self" to regulate the intensity of the self sense. I also stress aspects of consciousness like memory, sensation, thought and images from the unconscious, rather than emotions (feelings). This capacity while Focusing to move easily away from being overwhelmed often has to be practiced for months, dealing with the conflicts of daily life (which are numerous for a victim of PTSD) before spending time with the deeper felt senses." "Empowerment is central to both Focusing and EMDR. Shapiro wants "to convince the client that she is larger than the pathology and can effectively remain an observer of its previously overwhelming effects." (p.138) In Focusing, too, clients are taught to find ways of getting an appropriate distance between themselves and their situations, so that they can observe their issues rather than being overwhelmed. (Armstrong, 1988) The helpless, out of control state of the trauma survivor is further addressed by integrating client-centred EMDR into the therapy." "Trauma is a devastating moment, frozen in time. When a person is overwhelmed, he or she becomes frozen in fear. Trauma creates an internal straitjacket, stifling the unfolding of being and halting forward movement. It is as though life itself becomes frozen in time. "Healing trauma requires having a 'felt sense' because trauma is an innately mediated process. It cannot be effectively dealt with through verbal or by emotional expression alone. Rather the instinctual language of bodily sensing is what allows the fixated moment to sequence and move along in time. In this way, traumatic fixation opens to flow and transformation." Explore these links to learn more about trauma, traumatic stress, post-traumatic stress disorder (PTSD), and the way Focusing is being used to help resolve and heal trauma. "Using Focusing to work with trauma survivors"
This handout, which Shirley Turcotte uses in her training program for therapists, contains a wealth of practical wisdom about the treatment of trauma. This site focuses on the work of Dr. Peter Levine and the development and use of ''Somatic Experiencing®", a short-term naturalistic approach in which attending to the felt sense is seen to be absolutely critical to the resolution and healing of trauma. "David Baldwin's Trauma Information Pages"
This award-winning site provides information for clinicians and researchers in the traumatic-stress field by linking to articles; research; general support information; and books on trauma, disaster response, and PTSD. Within Baldwin's site is this page - designed for individuals seeking information about types of trauma, trauma responses, ways of coping with stress, and treatment approaches. Here Deirdre (Ricki) Morse discusses stages in the process of working with a traumatized person as they re-establish the sense of being safe and in control. "Focusing in Changing Abusive Fighting to Constructive Conflict Interactions" RWV Therapy Groups with Domestically Violent Men. Presented by Dr. Ralph Bierman, 1999 ©, at the 11th International Focusing Conference, Ontario, Canada. Shaun Phillips, M.Ed., R.C.C., S.F.T.T.